125 CC Sanya, Electric Start, Four Cycle for 325,000 CFA and 50,000 CFA for Insurance and Plates, this is about 750-800 US dollars, and I should be able to resell it for about 450-500 or more after one year of use. I am now the semi-proud owner of a 125 CC large chasis Sanya, made in China motorcycle. It was an internal fight, a struggle up to the moment I rode away form the shop, should I or shouldn’t I buy this motorcycle. In the end, I think I am safer to drive the motorcyle myself on roads with very few cars. West Africa has what I would say is very light traffic, except in largest city per country. I feel that a person who knows a road is a better driver than a person who does not know the road. However, these are not difficult to drive roads. I must use a motorcycle, I have no choice, I must either take a Motorcycle Taxi or I must drive my own motorcycle. 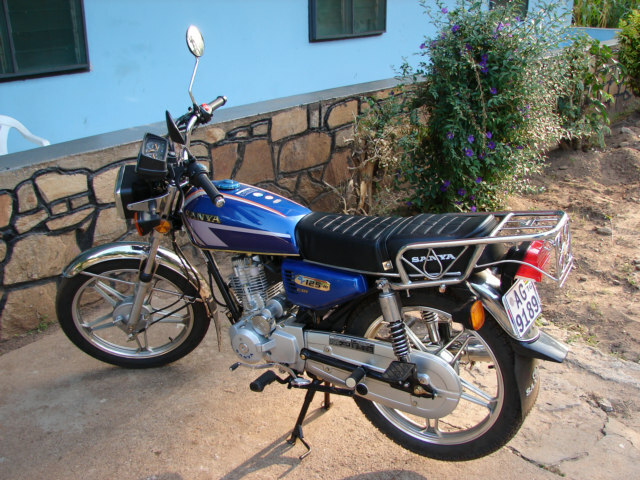 If I thought I would stop taking motorcycle taxis or that was even remotely possible in Togo, I would have abandoned the idea of buying a motorcyle. I just returned from an afternoon drive around the city, I feel confident now in my decision, I was not in one too-close-to-the-other-motorcyle moment the whole time I was gone. Normally, what is difficult for me to handle of their driving is they will not allow more than the width of a persons distance when they pass either a person walking or another motorcycle. This is not enough allowance for human error. If a person sways or jumped into the road, there would be an accident. When I driver I allot adequate space between me and the othere people walking or driving to allow time to stop. I feel safer now, I do hope I am not delusional. I drove up many a small lanes, drove way up the hills of Atakpame, and around in small neighborhoods. I saw in one hour more small unique area then I knew existed, they were just annoyingly too far of a walk to explore before. I am thinking this is my new exploring the world friend. A motorcyle will go many remote places and allow me to take more photos of my world.